Surgical site infections account for ∼15% of nosocomial infections and are associated with prolonged hospital stay and increased costs. Prophylactic use of antibiotics aims at reducing the incidence of postsurgical wound infection. Inappropriate prophylaxis, whether unnecessary use of broad-spectrum agents or continuation of therapy beyond the recommended time period, is frequently seen. Indeed, this increases the risk of adverse effects and promotes the emergence of resistant organisms. Controversy remains as to the necessity of prophylaxis in specific surgical procedures, as well as with regard to the duration of prophylaxis. The aim of this review is to discuss the criteria upon which decisions pertaining to the use of prophylactic antibiotics are based using the best clinical evidence available. Special emphasis is directed towards the selection and proper time and duration of administration. This review focuses on gastroenterological surgeries. Analyses of other surgeries will follow. It is becoming increasingly clear that the solution to the problem of postoperative pain management lies not so much in the development of new techniques as in the development of an organization to manipulate existing expertise based on team approach. Such acute pain service is part of a strategy to decrease perioperative morbidity and reduce healthcare costs. The American model of acute pain service is anaesthesiologist based in order to provide high-quality analgesia through expensive high-tech pain management. In contrast, the European model encourages a cheaper nurse-based anaesthesiologist-supervised approach. For over a decade I have been under the strong belief that efforts are needed in Egypt to design an appropriate service for acute pain for postoperative surgical patients on the basis of sound scientific foundation. The present review suggests an organization model that addresses the difficult equation in Egypt, being a developing or rather a poor country with limited financial resources, lacking a wide base of algologists and high-tech nursing staff and having hospitals that are mostly multispeciality in nature. Such an Egyptian organization model for acute pain service may open the door to other African and Mediterranean pain authorities, with similar difficult equations, to introduce their own organizational models. Guided by the International Association for the Study of Pain, the interaction of these models might push to light a Third World Acute Pain Service model side-by-side with the now-available American and European models. To apply the intraoperative wake-up test, the anesthetic regimen needs to enable rapid and smooth patient recovery, an immediate neurological examination, as well as adequate postoperative amnesia. In this study, we aimed to investigate two different anesthetic regimens (sevoflurane/dexmedetomidine vs. sevoflurane/fentanyl) in patients undergoing spinal surgery with respect of the quality and the profile of the wake-up test and postoperative recall. Forty patients (ASA II) aged between 18 and 60 years, undergoing corrective spinal surgery, were included in this single-blind randomized study. They were divided into two groups, both which were anesthetized using sevoflurane in O2/N2O: the first group (Dex group) was administered an intraoperative infusion of dexmedetomidine (1 μg/kg/h) for 10 min as a loading dose, which was then reduced to 0.5 μg/kg/h for up to 30 min before the wake-up test and then reduced to 0.1 μg/kg/h during the test; the second group (Fent group) was administered an intraoperative fentanyl infusion (2 μg/kg/h) for up to 30 min before the wake-up test; this was stopped during the test. Time from stoppage of anesthesia to spontaneous breathing (T1), time from return of spontaneous breathing to eye opening (T2), and time from eye opening to hand and feet movement (T3) were recorded in both groups. In addition, the quality of the wake-up test was evaluated on a three-point rank scale. Recovery and extubation times were recorded for the postoperative wake-up test. On the second day, postoperative recall was evaluated by assessing the memory for a given color during the test. T1, T2, and T3 in the Dex group (6.2±3.1, 3.6±2.2, and 1.1±1.2 min, respectively) were significantly shorter those in the Fent group (8.9±2.1, 5.7±3.2, 1.8±0.8 min, respectively). No significant difference was observed between the two groups in terms of the quality of the wake-up test. No patient of the Dex group could recall intraoperative events, whereas four patients of the Fent group could, two of whom could recall the color presented intraoperatively. Postoperative recovery and extubation were significantly faster in the Dex group than in the Fent group. Sevoflurane/dexmedetomidine anesthesia can result in faster recovery and a higher degree of postoperative amnesia compared with sevoflurane/fentanyl anesthesia, as shown from the wake-up test performed during corrective spinal surgery. Patients with coagulopathy of chronic liver disease are more vulnerable to the risk of bleeding during surgery. The role of fresh-frozen plasma (FFP) in reversing conventional coagulative tests may be uncertain in such patients. This study evaluates the impact of tranexamic acid (TA) on FFP and blood transfusion requirements during major orthopedic surgery in cirrhotic liver patients. Forty-eight patients (age 50–70 years) with chronic liver disease undergoing total hip replacement were randomized to one of two groups. In the TA group, patients received 10 mg/kg of TA diluted in 50 ml saline and administered by infusion over 15 min 2 h before surgery and another dose during the first hour of surgery. In the control group, patients received equal volumes of normal saline. Patients’ characteristics, laboratory investigations, volume of blood loss, number of patients who received FFP and blood transfusion, number of units transfused as well as perioperative complications were recorded. Patient characteristics and laboratory results were comparable between the two groups. Percentage of candidates who received FFP and number of FFP units were significantly higher in the control group [75% and 2 (1–2) U] than in the TA group [41.7% and 0 (0–2) U] (P=0.039 and 0.020, respectively). Volume of blood loss and blood units transfused in the TA group [680±170 ml and 0.5 (0–2) U] were significantly lower than those in the control group [1060±220 ml and 2 (1–2) U] (P=0.0001 and 0.018, respectively). No significant difference in postoperative complications was recorded. Perioperative administration of TA in patients with chronic liver disease is safe and reduces the need for FFP and blood transfusion during total hip replacement. The aim of this work was to study the effect of the alveolar recruitment maneuver followed by positive end expiratory pressure on gas exchange in morbidly obese patients undergoing laparoscopic reduction gastroplasty and to study its effect on postoperative patient outcome. This prospective controlled randomized clinical trial was conducted on 40 patients with BMI greater than 40 kg/m2 who underwent laparoscopic reduction gastroplasty under general anesthesia. The patients were allocated randomly into two equal groups: group I (the control group) included patients whose lungs were ventilated using the standard method and group II (the study group) included patients whose lungs were ventilated as in group I and for whom the lung recruitment maneuver was then performed by inflating the lungs with a positive pressure of 40 cmH2O, maintaining this pressure for 15 s, followed by positive end expiratory pressure of 8 cmH2O. This was repeated every 10 min throughout the procedure until extubation in the ICU. At the end of the surgery, all patients were transferred intubated to the ICU until extubation and then transferred to the intermediate care unit for 24 postoperative hours. Volume of arterial blood gases, mean arterial blood pressure, heart rate, operative time, time to extubation, duration of ICU stay, and the number of patients in need of postextubation ventilatory support were recorded throughout the study. Hemodynamic variables showed no significant difference between the groups. PaO2 showed a highly significant increase in both groups after intubation, but increase in PaO2 was more significant in group II than in group I. PaCO2 and pH showed no significant difference between groups. There was a significant decrease in extubation time and duration of ICU stay in group II patients in comparison with group I. As regards the postextubation ventilatory support, only one patient in group II needed a postextubation continuous positive airway pressure mask for 1 h, whereas in group I four patients needed a postextubation continuous positive airway pressure mask and one of them required reintubation. Lung recruitment maneuver is a suitable and beneficial technique during recovery in morbidly obese patients with minimal side effects. It is also beneficial in decreasing the time to extubation and duration of ICU stay. The fiberoptic bronchoscope (FOB) is one of the most common instruments used for intubating the trachea. This study assesses the effectiveness of a training program for novice anesthetists by assessing the performance and success rate of fiberoptic-guided tracheal tube placement using the air-Q or the modified Williams airway. A total of 100 patients were randomly assigned to one of two groups: in group A, FOB tracheal intubation was performed guided with an air-Q intubating laryngeal airway, and in group B, FOB intubation was performed guided with a modified Williams airway (under patency). Induction and intubation time were measured. Incidence of obstructed bronchoscopic view and ease of fiberoptic intubation were determined, postoperative patient and anesthesiologist questionnaires were administered, and complications were recorded. The time required for induction of anesthesia, airway insertion, and intubation was significantly lower in group B than in group A. The number of patients intubated by the primary anesthesiologist was higher in group B than in group A. There was significantly lower tube hold up in group B than in group A. Anesthesiologists were significantly more comfortable with the use of the modified Williams airway. There was no statistically significant difference in the occurrence of sore throat and hoarseness between both groups; the incidence of airway injury (visible macroscopic blood stains on device removal) was higher in the air-Q group than in the modified Williams group, but it was not statistically significant. Novices could be taught fiberoptic intubation more easily with the aid of the modified Williams airway than with the aid of air-Q under similar conditions. The safety and effectiveness of this training regimen using either airway recommend it for inclusion in any residency program. Agitation during emergence from general anesthesia is a major postoperative problem that often results in injuries to the patients. It requires the medical staff to restrain and calm patients. The aim of the study was to determine the effect of midazolam as a sedative–hypnotic drug on the emergence agitation effect of sevoflurane and also to determine whether the effect of sevoflurane inhalational agents on emergence agitation is because of the nature of anesthetic drugs or because of other predisposing factors such as pain and stress. After approval from the local ethics committee was obtained, 60 children were included in this double-blind randomized study; the inclusion criteria were ASA I and children aged 1–5 years undergoing nonpainful ocular examination. The children were randomly allocated to two groups. Group S (N=30) received sevoflurane and group SM (N=30) received sevoflurane after premedication with midazolam. A graded inhalational induction technique was used. After discontinuation of anesthesia, all children were allowed to have a calm recovery; on admission to the recovery room, assessment started every 5 min for 15 min according to the Pediatric Anesthesia Emergence Delirium (PAED) scale. Monitoring included calculation of the mean arterial blood pressure, heart rate, and SpO2. The two groups were comparable in patient characteristics and operative time. After induction, there was a decrease in heart rate and mean arterial blood pressure in all the groups studied. During the recovery and postoperative period, there was an increase in heart rate that was less sharp in groups that received midazolam. The PAED scale score showed statistically significantly higher values in the S group compared with the SM group. Not only pain control but sedation may also be the proper management for prevention of sevoflurane emergence agitation in children. Addition of midazolam (0.1 mg/kg) produced an efficient sedation and may reduce the intensity of emergence agitation. Laparoscopic cholecystectomy is associated with a high rate of postoperative nausea and vomiting (PONV). This study was designed to compare the efficacy of a combination of low-dose dexamethasone and metoclopramide with ondansetron for the prevention of nausea and vomiting after laparoscopic cholecystectomy. A total of 120 ASA physical status I and II patients scheduled for elective laparoscopic cholecystectomy under general anesthesia were included in this randomized, double-blind, placebo-controlled study. The patients were randomly assigned to one of three groups (n=40): the ondansetron group (GO) comprised patients who received ondansetron (4 mg i.v.) at induction of anesthesia; the dexamethasone–metoclopramide group (GDM) comprised patients who received dexamethasone (2.5 mg i.v.) at induction of anesthesia and metoclopramide (10 mg i.v.) just before recovery; and the placebo group (GP) comprised patients who received the 2 ml of saline which is equal to volume of dexamethasone, ondansetron and metoclopramide injection. All patients underwent similar standardized anesthetic and surgical techniques. Nausea and vomiting were assessed during the first 24 h after surgery using an 11-point verbal numerical rate score, in which 0 indicates no nausea and 10 indicates severe nausea and/or vomiting or retching. The severity of PONV was graded using the same scale according to the degree of nausea or the presence of retching or vomiting as: mild (1–3), moderate (4–6), severe (7–10), and/or presence of retching or vomiting. The blood glucose levels and serum cortisol levels were measured before and after surgery. Adverse effects related to the medications used such as dizziness, constipation, urinary retention, sweating, sleep disturbances, or headaches were recorded. The total incidence of PONV during the first 24 h after surgery was 30% in GDM compared with 35% in GO (P=0.811) and 72.5% in GP (P=0.003). There was no significant difference between GO or GDM in the incidence of PONV (P=0.811). None of the GDM patients required a rescue antiemetic compared with three patients in GO (P=0.077) and eight in the GP (P=0.003). No significant increase in blood glucose level or decrease in serum cortisol levels was observed in GDM patients. The combination of low-dose dexamethasone (2.5 mg) and metoclopramide (10 mg) was as effective as ondansetron (4 mg) in the prevention of PONV after laparoscopic cholecystectomy without significant side effects. To compare the postoperative analgesic effect of bupivacaine 0.5% plus ketamine 20 mg and bupivacaine 0.5% alone in alleviating testicular visceral pain when it is injected for spermatic cord block in testicular sperm extraction (TESE) surgery. 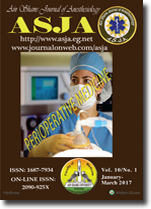 A randomized, double-blind, controlled trial study including 50 American Society of Anesthesiologists I–II patients undergoing TESE surgery was performed under general anaesthesia. At the end of surgery, patients were allocated randomly to one of two groups: the ‘K’ group (n=25) received bupivacaine 0.5% plus ketamine 20 mg and the ‘B’ group (n=25) received bupivacaine 0.5% alone in a total volume of 10 ml for spermatic cord block. Postoperative pain was assessed by measurement of pain-free time, which was defined as the time from regaining consciousness to the appearance of mild spontaneous testicular pain. Also, the visual analogue scale (VAS) score at 6, 9, 12 and 24 h being at rest was measured. The frequency of analgesic intake in the first 24 h was also determined and the incidence of postoperative nausea and vomiting (PONV) was recorded. The mean pain-free time was significantly higher in the K group than the B group [302 (48) vs. 225 (27) min, P=0.000]. The mean VAS score was significantly lower at 9 h postoperatively in the K group compared with the B group (P=0.017). Although the mean VAS scores were lower at 6, 12 and 24 h in the K group, there were no statistically significant differences between the groups (P=0.1, 0.186 and 0.086, respectively). Differences in the frequency of analgesic intake between the two groups were not statistically significant. There was no statistically significant difference between the groups in PONV. The addition of ketamine (20 mg) as an adjuvant to bupivacaine for spermatic cord block is a good option for postoperative pain control as it prolongs pain-free time and lowers VAS scores after TESE surgery, with no added risk of PONV. Sciatic and saphenous nerves are the two main nerves supplying the ankle joint. The aim of this study was to evaluate the contribution of sciatic popliteal and saphenous nerve blocks to intraoperative and postoperative pain relief during and after major ankle surgeries. A total of thirty patients were included in this prospective, randomized, controlled study. All patients in both groups (A and B) received general anaesthesia and intravenous morphine boluses for pain relief during surgery and intravenous morphine patient-controlled analgesia for postoperative pain relief. Using high-frequency ultrasound probe guidance combined with nerve stimulation, the patients in group B underwent sciatic and saphenous nerve blocks after induction of general anaesthesia. The sciatic nerve block was performed using a popliteal approach, whereas the saphenous nerve block was performed through the subsartorial canal. Approximately 20–30 ml of levobupivacaine (0.5%) was deposited around the sciatic nerve, and up to 10 ml of the local anaesthetic was injected around the saphenous nerve. The intraoperative haemodynamic variables were recorded. The total intraoperative and postoperative morphine consumptions were also recorded. The pain score was recorded using the Visual Analogue Scale during the recovery and postoperative period, up to 48 h after surgery. Postoperative sedation, patient satisfaction, opioid-related side effects, other postoperative complications, time to recovery-unit discharge and time to hospital discharge were compared between the two groups. The patients in group B had a significant reduction in the pain score during rest and movement during both the recovery and the postoperative period by more than 75% (P<0.05). Morphine consumption was significantly reduced in group B during surgery, and further reduced by more than 60% after ∼48 h (P<0.05). Incidence of adverse effects and opioid side effects were more common in group A compared with group B (P<0.05). Patient satisfaction and early recovery and hospital discharge were higher in group B compared with group A. The combined sciatic (through the popliteal approach) and saphenous (through the adductor canal) nerve block provided better postoperative analgesia during rest and movement after major ankle surgery and improved patient outcome and patient satisfaction. The aim of this study was to compare the effect of adding low-dose ketamine or lornoxicam to propofol in outpatients undergoing hysteroscopy with respect to patient and doctor satisfaction, recovery and discharge time, and intraoperative and postoperative adverse effects. This is a double-blind prospective study on 60 ASA I and II patients undergoing outpatient operative hysteroscopy. They were divided randomly into two equal groups: group KP and group LK. Patients in group KP received 0.25 mg/kg ketamine followed by 2% propofol boluses of 20 mg/ml until a bispectral index (BIS) of 70 was achieved; patients in group LK received 8 mg lornoxicam followed by the same propofol boluses until the same sedation level was achieved. Incremental boluses of 1–2 ml of propofol were given all through the procedure to achieve BIS 70. Time to reach BIS 70, total dose of propofol given, recovery and discharge time, patient and doctor satisfaction, and intraoperative and postoperative adverse effects were all assessed. Time to reach BIS 70 was statistically shorter in the ketamine–propofol group (2.1±1.1 min) than in the lornoxicam–propofol group (3.7±1 min). The total dose of propofol was statistically higher in the lornoxicam–propofol (197±15.8 mg) group than in the ketamine–propofol group (176.2±16 mg). Recovery time and discharge time were significantly shorter in the lornoxicam–propofol group than in the ketamine–propofol group. Patient and doctor satisfaction scores were significantly higher in the ketamine–propofol group than in the lornoxicam–propofol group. Postoperative hallucination and agitation were statistically higher in the ketamine–propofol (16.6%) group than in the lornoxicam–propofol group. Addition of 0.25 mg/kg ketamine to propofol is a reliable method for providing satisfactory sedation and analgesia in patients undergoing outpatient hysteroscopy in comparison with lornoxicam–propofol. Ambulatory anesthesia is becoming a major part of an anesthetist’s workload. Inadequate postoperative analgesia can delay discharge and impair a patient’s return to full function. The aim of this study was to evaluate the analgesic efficacy of intravenous ibuprofen as a newly intravenous analgesic and tramadol when used alone and when combined. This blind randomized study included 75 patients according to American Society of Anesthesiologists physical status I and II, aged between 19 and 46 years, and scheduled for arthroscopic reconstruction surgery. Patients were randomly allocated into three equal groups: group I received ibuprofen 800 mg intravenously, group II received tramadol 100 mg intravenously, and group III received a combination of both drugs ibuprofen 400 mg and tramadol 70 mg intravenously after induction. In all patients, anesthesia was induced with propofol (2–3 mg/kg), fentanyl (2 μg/kg), and a single dose of cisatracurium 0.15 mg/kg. Pain during rest and mobility was assessed in the immediate postoperative period, 2, 4, 6, and 8 h successively using the visual analogue scale (VAS), and opioid consumption was recorded. Group III showed significantly less consumption of morphine doses in comparison with either group I or group II. Although there was no statistically significant difference in VAS during rest among all groups, group III still had the least VAS scores during knee movement that was significant in comparison with group I or group II. Also, group I was statistically significant higher than group II. Eight hours postoperatively, there was significantly greater patient satisfaction with the postoperative pain management in group III in comparison with group I and group II. A combination of intravenous ibuprofen and tramadol has been shown to provide better analgesia and higher patient satisfaction than each drug used separately. The combination of both drugs decreased the doses of each, which helped to avoid adverse effects. The aim of this study was to compare the efficacy of hypertonic saline (HS) (3%) (4 ml/kg), normal saline (NS) (0.9%) (13 ml/kg), and hydroxyethyl starch (HES) (6%) in the prevention of hypotension after spinal anesthesia for cesarean section. Sixty healthy parturients scheduled for elective cesarean delivery under spinal anesthesia were included in this randomized prospective study. The patients were randomly assigned to receive 4 ml/kg of HS (3%) (group HS: n=20), 13 ml/kg of NS (0.9%) (group NS: n=20), or 500 ml of HES (6%) (group HES: n=20) before spinal anesthesia. Blood pressure and heart rate were measured before preloading, after preloading, and after spinal injection throughout the procedure. Hypotension was treated with intravenous boluses of 5 mg of ephedrine. Serum sodium levels were measured before and after fluid preloading and after 30 and 90 min. The neonatal outcome was assessed using the APGAR scoring system. Two patients (10%) in the HS group, six patients (30%) in the HES group, and 13 patients (65%) in the NS group experienced hypotension, thus the incidence of hypotension was significantly lower in the former two groups. The total dose of ephedrine required by the HS and the HES group was significantly lower compared with that required by the NS group. The heart rate showed no significant differences among the three groups throughout the procedure. Serum sodium concentrations showed no significant differences between the three groups before preloading, after preloading, and after 30 and 90 min. There were no significant changes in each group during the study period. The neonatal outcome was excellent in all three groups. HS (3%) at a dose of 4 ml/kg is a safe, inexpensive, and effective preloading fluid in parturients undergoing cesarean section under spinal anesthesia for the prophylaxis against hypotension. HS (3%) can be recommended for fluid preloading in situations in which excess free water administration is not required. The aim of this study was to evaluate the effects of thoracic epidural analgesia (TEA) with bupivacaine compared with postoperative intravenous morphine during thoracic surgery. A total of 40 patients were randomly divided into two groups with 20 patients in each group: group I (control group) comprised patients receiving general anesthesia and intravenous morphine for postoperative pain relief; group II (bupivacaine group) comprised patients receiving general anesthesia combined with 0.1 ml/kg of 0.25% bupivacaine plus 20 µg/ml fentanyl through an epidural catheter, followed by a 0.1 ml/kg/h infusion of bupivacaine for postoperative pain control. The present study proved that TEA provides optimal analgesia with better postoperative pulmonary function, oxygenation, and clearance of secretions secondary to pain control. In addition, TEA combined with general anesthesia is superior to general anesthesia and postoperative intravenous morphine as it reduces hormonal and metabolic stress responses, allows early extubation of our patients, decreases the length of stay in the intensive care unit, and decreases the incidence of postoperative side effects. Fentanyl is a commonly used adjuvant for spinal anesthesia as it improves the quality and prolongs the duration of analgesia. However, contradictory data have been reported in the literature on whether the administration of intrathecal fentanyl might lead to acute tolerance to postoperatively administered opioids. A total of 75 consented male patients undergoing elective unilateral inguinal hernia repair were enrolled into this randomized, double-blind, controlled study. All patients belonged to ASA grade I–II, were aged between 20 and 55 years, and were taught to use the patient-controlled analgesia and visual analog scale. After undergoing standard monitoring procedures, the patients were randomly allocated into three groups on the basis of administration of one of three prepared intrathecal injections through a 25-G spinal needle. Patients in group C received 3.5 ml of hyperbaric bupivacaine (0.5%), patients in group F10 received 10 μg of fentanyl, and patients in group F25 received 25 μg of fentanyl. The postoperative visual analog scale were measured at 0, 1, 4, 8, 12, 18, and 24 h. Morphine doses were recorded at 0–4, 4–8, 8–12, and 12–24 h, postoperatively. The pain scores were higher in group C during the first hour of postanesthesia care unit admission compared with group F25. Morphine consumption was higher in group C (12 mg) compared with groups F10 and F25 (8 and 7 mg, respectively). Between 4 and 8 h, the consumption was similar in all groups. Between 8 and 12 h, the consumption increased in group F25. Between 12 and 24 h, the consumption continued to increase in group F25 (19 mg) when compared with groups C and F10 (14 and 15 mg, respectively). The mean time to the first morphine bolus was shorter in group C.
Intrathecal fentanyl (25 μg) in spinal anesthestics may lead to postoperative opioid tolerance. Sepsis and septic shock represent a systemic inflammatory state with considerable procoagulant elements. Unfractionated heparin (UFH) is a known anticoagulant, which also has anti-inflammatory properties. To evaluate the impact of an intravenous low dose of UFH in a cohort of patients diagnosed with septic shock. Retrospective, propensity matched, cohort study. Ain Shams hospitals ICU units. One hundred and forty-six of 270 patients diagnosed with septic shock. Patients were assigned randomly to receive placebo or a low dose of UFH 500 IU/h for 7 days after ICU admission. The primary outcome was the effect of UFH on mortality over 28 days and the secondary outcome was the safety of heparin assessed by comparing the activated partial thromboplastin time values and the need for allogenic transfusion. The systemic administration of low-dose UFH in septic shock is associated with a decrease in mortality over the 28 days [eight of 60 (13%) vs. 18 of 64 (28%), P<0.05]. The activated partial thromboplastin time throughout the course of the therapy showed comparable results in both groups (P>0.05). Moreover, there was no significant difference in the rate of allogenic transfusion between the placebo group and the UFH group (P>0.05). Early administration of intravenous low-dose UFH may be associated with a decrease in 28-day mortality when administered to patients diagnosed with septic shock. Sepsis is associated with a hyperactive inflammatory system, leading to an overproduction of proinflammatory mediators that contribute toward septic shock, multiple organ failure, and death. As statins have anti-inflammatory properties that are independent of their lipid-lowering abilities, we hypothesized that septic patients may benefit from atorvastatin treatment. In this prospective study, 60 adult patients were admitted to the ICU, with early sepsis criteria. Patients were randomly assigned to two groups: an atorvastatin group that received 40 mg atorvastatin for 10 days and a control group (statin free). The primary outcomes were the time of decrease in C-reactive protein, interleukin 6 levels, and white blood cells count and the secondary outcomes were hemodynamic variables, organ dysfunction, and failure that were defined by the sequential organ failure assessment score and hospital mortality from any cause during the study period (10 days). The atorvastatin group had highly significantly lower white blood cells counts, interleukin 6, C-reactive protein, and sequential organ failure assessment scores (P<0.001) compared with the control group. However, there was no significant difference between both groups in hemodynamic variables and mortality (P>0.05) during the study period. Atorvastatin ameliorates the inflammatory response in septic patients and may improve the short-term outcome. Posterior reversible encephalopathy syndrome is a rare condition that needs a high index of suspicion. It is a clinical and radiological presentation described in patients with different conditions as such as hypertensive encephalopathy, eclampsia, uremia and with immunosuppressives. Early recognized and adequate treatment, may reverse the condition, otherwise permanent neurological sequelae are likely to occur. Persistent neurological impairment following spinal anesthesia with bupivacaine has rarely been reported. We report three cases of neurological deficits that persisted more than 3 days after an uncomplicated single intrathecal injection of 0.5% hyperbaric bupivacaine. The first two cases were female patients 39 and 37 years of age and who had received spinal anesthesia with bupivacaine to undergo dilatation and curettage and cesarean section, respectively. The third case was a 22-year-old male patient who received bupivacaine spinal anesthesia for right knee arthroscopy. MRI indicated no anatomical abnormality in any of these cases. Bupivacaine neurotoxicity was suggested by the absence of any other identifiable cause for these neurologic deficits. Corticosteroid was used to manage the cases, with a diverse outcome in each case.